Punclut is one of the highlands in Bandung that presents a variety of fun. We can see the beautiful view of Bandung accompanied by pepes mushrooms, grilled pete, fried eel, and sambel dadak. Punclut hills can be reached by passing Ciumbuleuit road. This location we can visit at any time, and most beautifully enjoyed at night. This place in colonial times is often referred to as Dago Thee Huis. This place provides a beautiful view of Bandung. At night, we can see the beauty of the city from the height of Dago. If we are lucky then when visiting Dago Tea House we can enjoy various art performances. This road connects Jalan Surapati and Jalan Pasteur (Dr.Djundjunan). The length of this flyover reaches 2.8 km with a width of 30-60 meters. When you are on the flyover the view of Bandung will look beautiful at night. This location is visited by many young people to enjoy the view of the city of Bandung. Masjid Raya Bandung is located in the town square. The mosque has a tower with a height of 86 meters. We only need to pay infak money of two thousand to three thousand rupiah once up. The tower has a capacity of 80 people. We can see the view of Bandung from the top of this minaret. This location is located in Dago Atas, north of Bandung City. This location is located after the area is packed with various cafes and restaurants. We can enjoy the view of Bandung from above Dago. This plain is often called Cartil. We can pass Jalan Padasuka to get here. The area located in District Cimenyan is called Caringin Tilu or Beringin Tiga in Indonesian language. There are various cafes that we can visit in this place. We can also enjoy the beautiful panorama of Bandung city from this place.That is the highland locations in Bandung that we can visit to enjoy the view of Bandung. 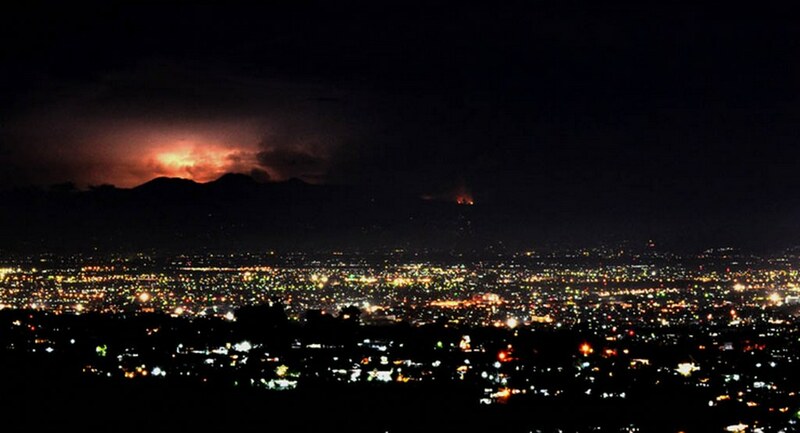 Bandung city is very beautiful when viewed from above, especially at night. ALADDIN CARPET AT DAGO DREAM PARK !